”Oh, damn girl I’m so sorry! They are all bookmarked to giveaways and stuff! And to my mom!” She said, when I asked if I could buy one of the hot-off-the-presses ’My New Roots’ books that I knew had arrived just the other day. I was stuffing things into my green backpack while texting to Sarah about train details. Sure, a bit bummed that I had to wait another couple of weeks before I could have one of her books at home but mostly excited for our awaiting 24 hours of total us-ness. We were planning to celebrate her book release, my birthday, AND being together alone for the first time since our little boys came earthside. Even though this is now one year ago I still remember the silly emoji-loaded texts shooting like rockets back and forth as the weekend approached. We. Were. Psyched. I finally arrived to our regular ’totally-blissing-over-here-wear-earplugs-please-wohoooos’s’ and Sarah had of course wrapped one of her books as my birthday gift. With recycled paper & feathers cuz that’s how we roll. And, and.. a complete love-letter written on the inside of the hard cover. 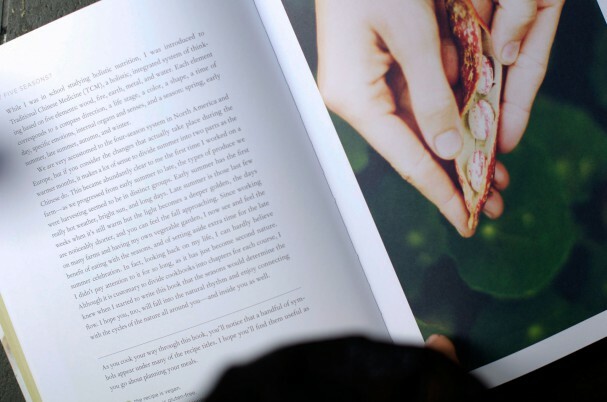 Even though the messily (you know it, Sarah ;) handwritten letter is something I treasure every time I open my book, ’My New Roots – inspired plant-based recipes for every season’, is in itself a love letter to both the earth and to everyone lucky enough to have a copy. If you don’t have it in your kitchen yet, you know what to do. I know I’m very late to the party, sharing this recipe here but book or no book I’m always applauding Sarah’s creativity. I stand in awe of all the incredibly hard work and long hours she has and continues to put into this My New Roots. Just by flickering through the pages of this book for a few moments you can tell it’s is one of the most real cookbooks out there. Not just because of the insanely tasty recipes but also because of the humorous and heart centered writing, the stunning photos, and details like the moon over the recipes that require overnight waiting. (Rooibos Ginger Sun Tea) and I’ve heard funny background stories (Ginger-Rosemary Roasted Grapefruit w Macadamia Nut Cream & Rawkin’ Funky Monkey Ice Cream). 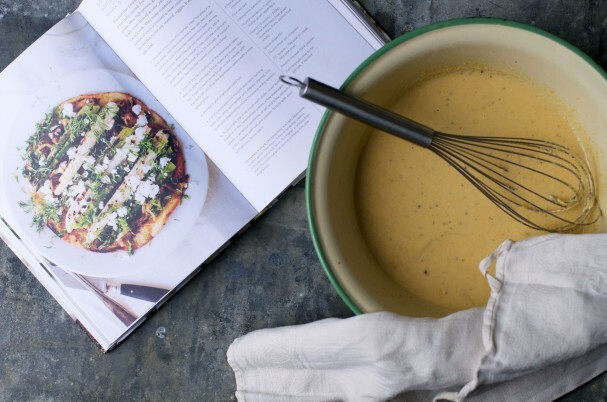 Just by reading this lineup of recipes you’ll know how rad this cookbook is. And then I haven’t even mentioned how Sarah divided the recipes into 5 different seasons. Yes, five. It’s all very genius. Sarah is one of the brightest shining lights in my life. She is a worldwide source of inspiration and she is a (very hardworking) kitchen magician. 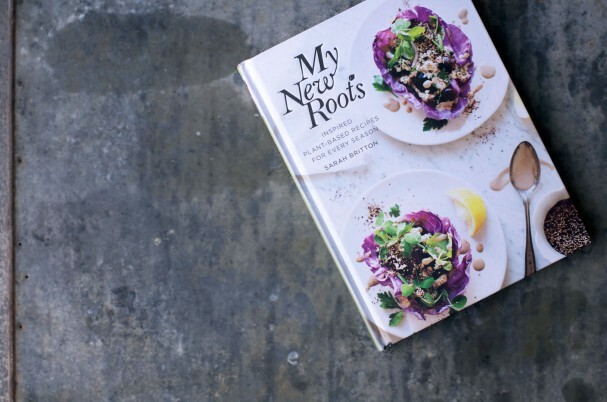 My New Roots continues to change the cooking game and My New Roots the book brings it all to your very own hands. Slightly adapted from plant based cookbook ’My New Roots’ by Sarah Britton. I love Socca and the first time I made it I used an old recipe from the My New Roots site. When deciding which recipe from the book to share here, this one was a given. Even if I should by now hang out in the ’Early Summer’ chapter and not ’Spring’. But! 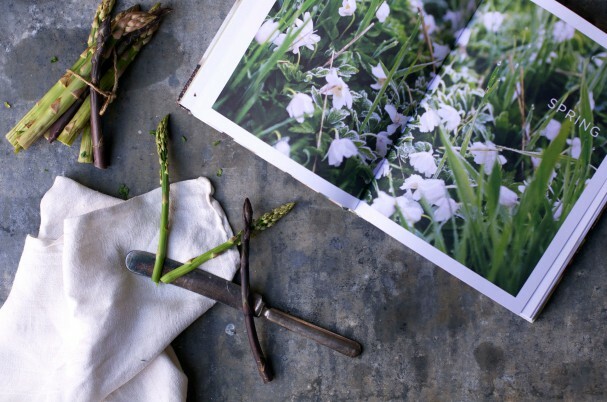 You can harvest asparagus until midsummer so we’re in the clear for a little while longer. 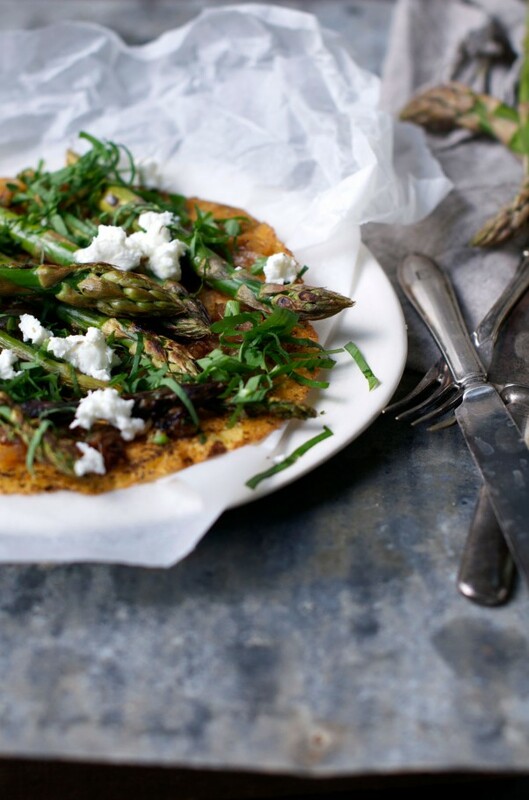 And the socca can obviously be made year-round and topped with whatever the season has to offer. 1. Add all ingredients to a large bowl and whisk until there are no chickpea flour lumps. Let sit covered for at least 30 minutes. I personally love preparing this base in the morning (or even night before) we’re having socca for dinner. It’s the best fast food that way! 2. In a large skillet, melt some ghee or coconut oil over high heat. When oil is hot, pour a quarter of the batter into the pan and tilt until bottom is covered. Let socca cook for about 5 minutes (it will form bubbles and have turned from shiny to opaque). Flip the socca and cook for about two minutes on the other side too. 3. Remove socca from pan and cover with tea towel until ready to serve. Continue process with remaining batter. 1. Slice onions into thin rounds. Heat ghee or coconut oil in large skillet, add onions and a few pinches of salt and stil to coat. Cook over medium-high heat stirring occasionally. When the pan becomes too dry, add a little of the balsamic vinegar. Cook until the onions are golden and caramelized, 20-25 minutes or longer if needed. Transfer cooked onions to a bowl. 2. 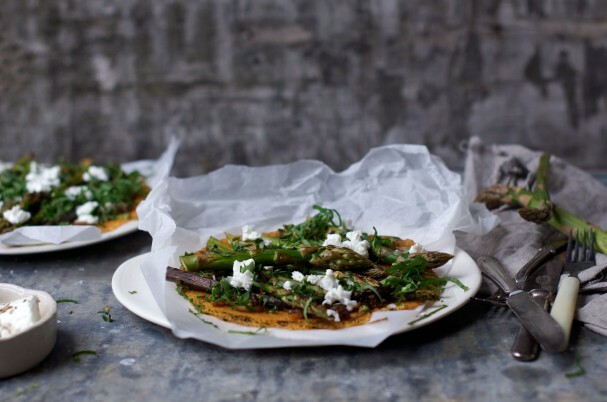 Snap off the hard bottoms of the asparagus stalks. If using white asparagus, peel if the stalks are thicker than your finger. Rub all asparagus stalks with a little melted ghee or coconut oil. 4. 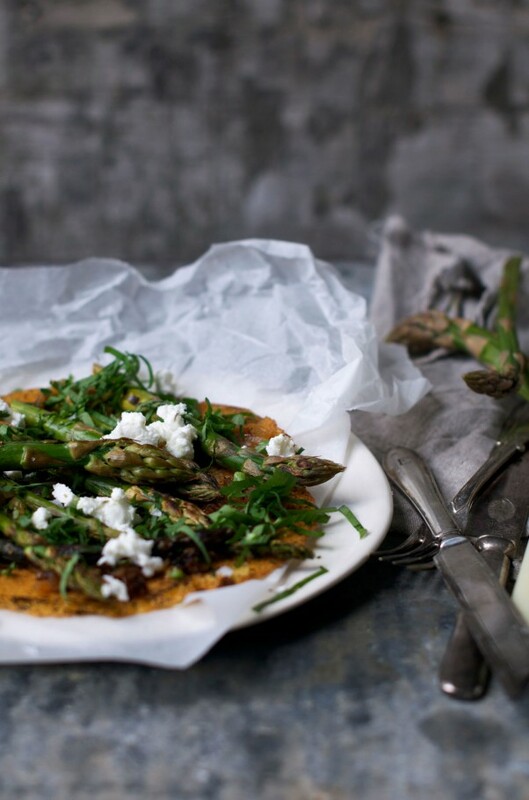 Cook asparagus until slightly charred but still with some crunch in them. 5. 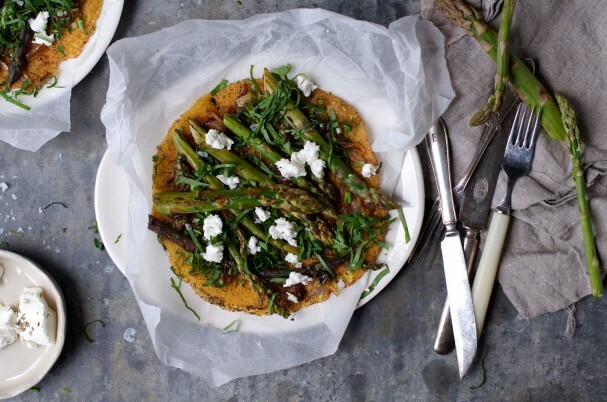 To assemble, put a socca on each plate, cover with a quarter of the onions, a few asparagus spears, a generous sprinkling of ramps (or dill! or both! ), and top with some cheese if desired. Serve warm. Enjoy! Have a gorgeous weekend my friends and I hope you get around to making this awesome meal. Sarah claims caramelized onions just may save the world, so I’m confident it would at least make your dinner approximately 200% more amazing then it would be without this Socca. Ready to rock your life & body? Sign up here... it's free! All content is © 2018 by Earthsprout. All rights reserved.